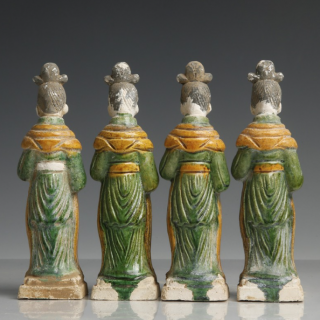 A set of green-glazed Chinese Ming dynasty earthenware figures. 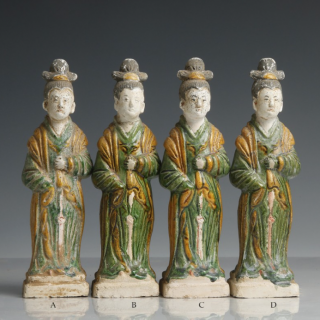 Each figure has been styled in long, flowing robes coloured a vivid green. Additional features have been accented in a deep amber yellow, highlighting the attendants sashes, hair ties and clothing accents. Their hair is tied into an elaborate top-knot and coloured a dull black. 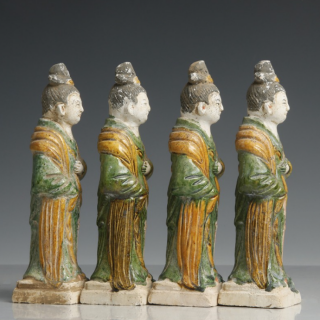 The hair, with its dull colouring, and the other areas left bare would have been ‘cold-painted’ after firing, to contrast to the vivid fired green and amber pigments. 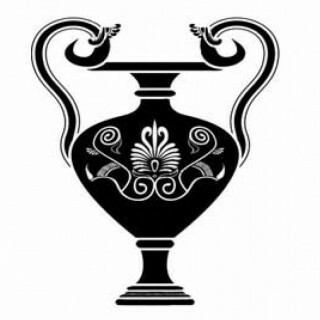 Figures such as these would have been placed in the deceased’s tomb, to attend to him in the afterlife. N.B. Price is per figurine. Very good, with bright vivid glaze and additional cold-painted detailing still remaining. Repair to figure B, re-attachment of head.